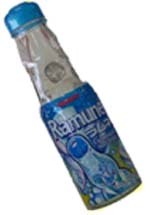 Ramune is a very popular carbonated soft drink in Japan. It has a sweet bubblegum taste, but what's particularly interesting about this product is the bottle and how you open it. Instead of having a cap, this fizzy drink is sealed with a glass marble stuck inside the bottle. The pressure of the carbonated drink keeps the marble in place until you want to pop it open. What you do is you remove the special opening that comes with the bottle and use it to push the marble down inside the bottle. There are two little glass knobs inside the bottle to hold the marble while you drink. Pretty cool, hum? The experience is worth itself. You can buy them individually or grad a pack. Then, just Pop it, Drink it, & Love it! Calpico is a famous brand of Japanese drink. We have Calpico milk drink, which uses the special technology (treatment with lactic acid) to enhance the taste and make milk components more easily digestible. It is perfect for children who do not like to drink fresh milk--just mix the Calpico with milk, they will love it. This is a natural drink and contains no artificial food additives. To make a healthy and tasty milk-flavored drink, combine 1 part of Calpico, 4 parts of cold water or carbonated water, and add ice. To make a warm winter drink, add hot water. And when you dilute it, you can add your favorite liquor or wine to make exotic cocktails! We also have the refreshing Calpico Mango juice you won't find in any other local grocery stores.